News was born free. Its roots can be traced back to the “Daily Acts”, decreed by Julius Caesar, that were placed on public message boards in Ancient Rome. They contained news on everything from political happenings to prominent marriages. Last month, Britain’s biggest-selling tabloid newspaper, the Sun, followed in this tradition by disarming its paywall. It may safely be inferred that this was largely for monetary reasons. Alas, the Sun has not suddenly emerged as a revenant of the enlightenment, fighting for the right of the public to free information. The fact is that the Sun has failed to garner the same number of views as its rivals, the Mail Online and the Mirror, behind its paywall. The advent of social media has diversified methods of news distribution, so whilst paywalls have gone up, barriers to journalism have fallen – the information behind a paywall can be placed on Facebook by anyone with an opinion. However, those newspapers without a wall can benefit from the social media users option to share, which generates subsequent click-through views. 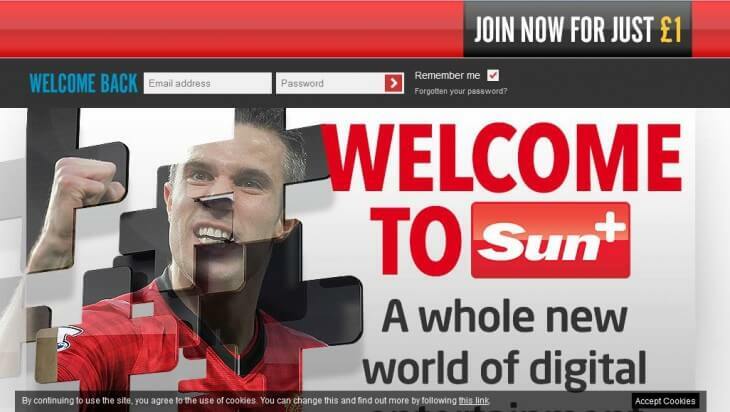 The Sun recently took down their paywall. However, free news will not last. The emergence of the digital age may have given news-lovers a brief, charge-free moment in the sunshine, but the sun is already setting. To understand this you must look to history. The appearance of the first modern newspaper was accompanied by a charge when the Venetians decided to charge one gazette for news-sheets in 1556. The newspaper meant that news was no longer a state-funded right but an independent and profitable venture. As long as there is money to be made, news will never be free. One survey has shown that nearly three-quarters of newspapers are now charging for online content and print-media is dying. The Sun’s publisher, News UK (owned by Rupert Murdoch), is, in fact, keeping the subscription model for its Times and Sunday Times publications. This model is also proving successful for publications such as the Wall Street Journal, Financial Times and the Economist. As soon as other news sources learn how to grow their audiences, take advantage of social media and make more from advertising they will erect paywalls. Other business models are simply inadequate when people are willing to pay. The future of the news is paved with paywalls. Why am I so sure of this? Look around you on public transport. Do you see young people carrying newspapers? Rarely. The real picture you see is dozens of people glued to their phones and this trend will certainly worsen as accessible WiFi spreads. The modern man doesn’t want to carry a newspaper; he wants quick, easy, weightless information. In fact, a 2013 study in the Guardian showed that 20% of 25-34 year-olds have already paid for online news. There will be no more Julius Caesar’s. There will only be newspapers catching up with technology.